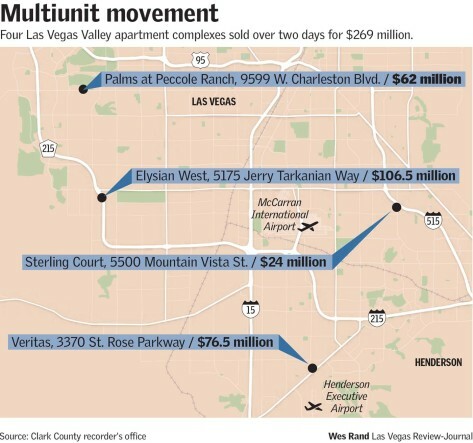 That’s how much was spent, in how many days, for four Las Vegas Valley apartment complexes last week — a burst of sales in a hot market that’s only getting more heated. The Blackstone Group, a New York investment giant that’s been snapping up Las Vegas real estate for several years, last Thursday acquired the 466-unit Elysian West in the southwest valley for $106.5 million — a record price for Las Vegas, according to the seller. The same day, Northern California’s DiNapoli Capital Partners picked up the 404-unit Palms at Peccole Ranch on Charleston Boulevard near Hualapai Way for $62 million, and New York-based Abacus Capital Group purchased the 237-unit Sterling Court near Russell Road and U.S. Highway 95 for $24 million, Clark County records show. Arizona-based Farnam Realty then bought the 430-unit Veritas complex at St. Rose and Maryland parkways for $76.5 million on Friday. The deals show that Las Vegas’ apartment market, with its rising rents, shrunken vacancies, and increased construction, isn’t cooling anytime soon — a windfall for contractors and landlords but potential concern for tenants facing bigger rent payments. Helping fuel the market’s expansion are the improved economy, a growing population, and low home ownership rates after last decade’s housing crash. It’s possible there is “a little run on these properties,” but the local economy is doing well and newly built complexes seem to be leasing up quickly, said John Stater, Las Vegas research manager for brokerage Colliers International. For instance, at South Beach Resort, a new luxury apartment complex on Russell Road at the 215 Beltway, renters have picked up an average of 45 to 60 units per month, developer Bob Schulman said. He expects the 220-unit complex to be fully leased by mid-October. Overall, apartment-complex sales and prices might cool down in Las Vegas if vacancies climbed, the valley gets flooded with too many projects, or if buyers think “all the good targets” have been purchased, Stater said. But for now, landlords are paying more and more. Apartment buyers paid an average of $105,100 per unit in Southern Nevada this year as of Aug. 1, nearly three times the average of $37,000 per unit investors paid in 2011 when the economy was battered by the recession, according to figures provided by Stater. Blackstone paid around $228,500 per door — more than double the market’s average — for Elysian West, located south of Tropicana Avenue just west of the Beltway. The complex opened last year and was 96 percent occupied at the time of sale, according to Calida Group co-founder Eric Cohen, whose firm developed and sold the project. It traded for a record overall price and record price per unit for a typical “garden-style” apartment complex in Las Vegas, he said. Such properties might span 15 to 20 acres with several two- or three-story buildings. Blackstone declined to comment on the record. Abacus and DiNapoli did not return calls seeking comment, and Farnam could not be reached for comment. Veritas was 96 percent occupied as of last week, according to brokerage Jones Lang LaSalle, which represented the seller, Texas-based Monogram Residential Trust. Palms at Peccole Ranch was around 95 percent occupied, said Mark Stern, senior vice president of acquisitions for Chicago-based Waterton, which sold the property to DiNapoli. In a sign of the valley’s rising prices, DiNapoli paid 36 percent above what Waterton spent for the complex in 2013, property records show.